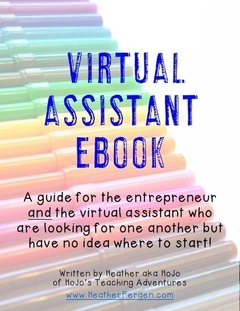 If you're wondering how to become a virtual assistant, this is the download for you! Likewise, if you are an entrepreneur looking for a VA - you're going to love how this book will help you get started. Heather created her first website back in the early 2000s, but she has been an online business owner since 2011 - becoming a virtual assistant to other entrepeneurs in summer 2015. She has been hiring out work on her blog since about 2012 - back when she didn't yet know that she was actually hiring VAs. 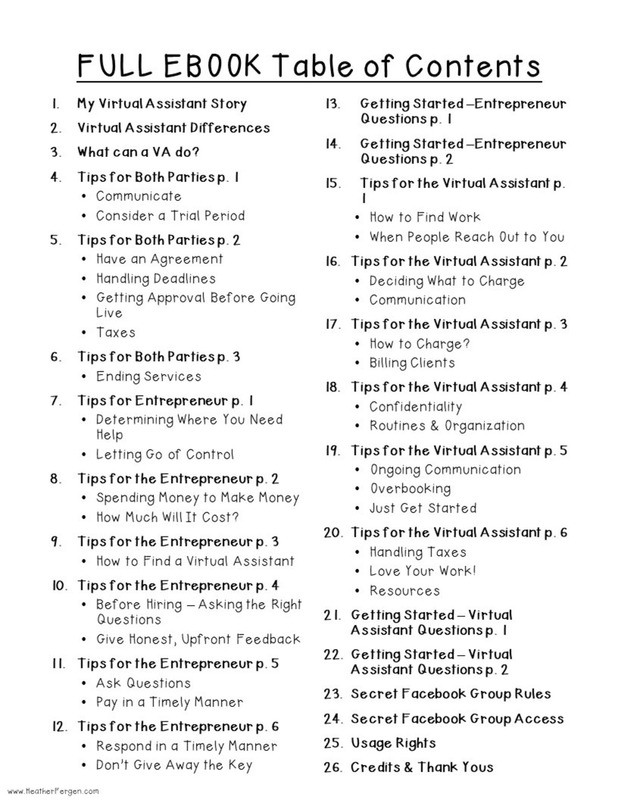 This 26 page ebook outlines her story, duties a virtual assistant (VA) can complete, tips for both the VA and the entrepreneurs, tips specific for the entrepreneur when considering hiring a VA, and tips for the virtual assistant who is just getting started. 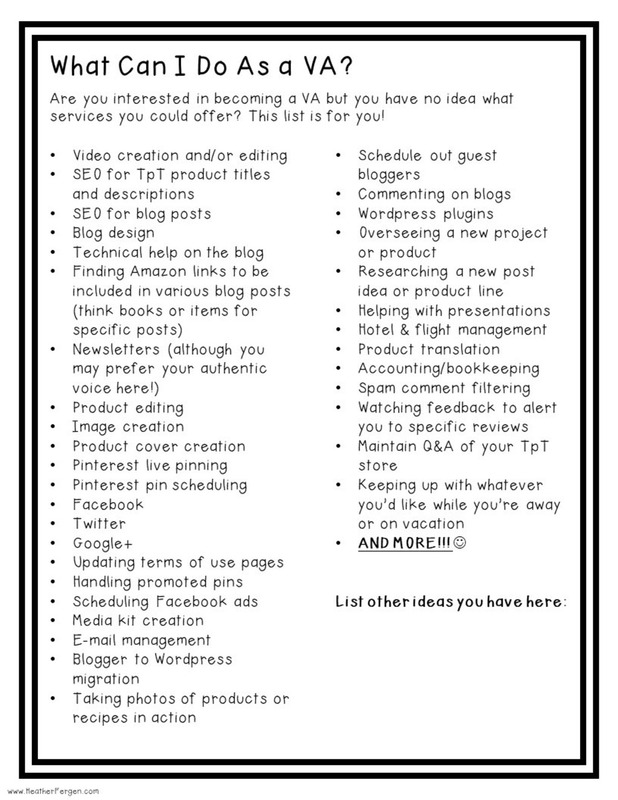 Please look at the preview images to see the full table of contents for this PDF download ebook. 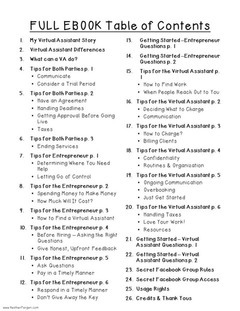 This ebook is meant for the entrepreneur who has not yet hired a virtual assistant and the aspiring virtual assistant who has not yet had any clients. While those who have experience hiring or being a VA may find the information in this ebook valuable, it is set up more for the novice. Please look at the preview image to see a page of all the tasks a virtual assistant may complete. This is just a starting point, as truly anything can be hired out - if the business owner desires. The best part about this ebook? You will be given access to a secret Facebook group just for entrepreneurs and virtual assistants who are seeking one another. Instructions for accessing this group are included on page 23 and 24 of your download. The Facebook group includes copies of the contract Heather uses (although she is not a lawyer, so definitely do your own homework!). As of January 2019, there are over 80 people in the group - allowing you to network, ask questions, and learn from others. You may also find someone to work with. If you are looking for a side gig to make some extra money, this may be a good fit for you. Likewise, you can certainly turn this side hustle into a full-time income! 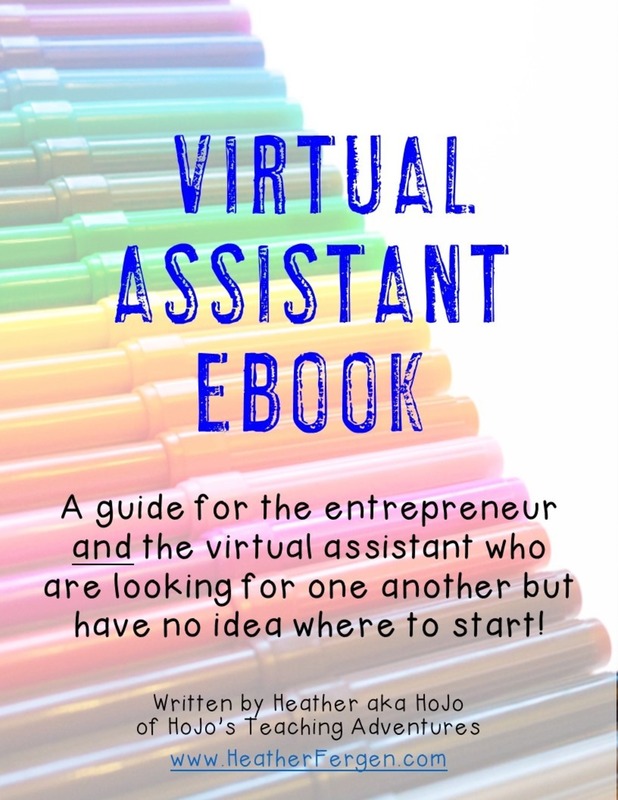 Read this ebook to find out how becoming a virtual assistant and helping others improve their TpT stores could be a good money maker for you. 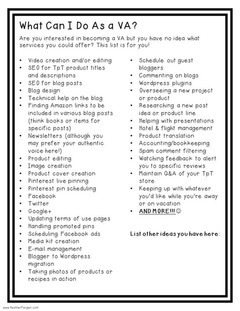 You can earn thousands of dollars each month - oftenstimes while being a stay at home mom to your own kid/dos.